VIEW OUR GEMSTONE RINGS CATEGORY FOR OUR CURRENT SELECTION. 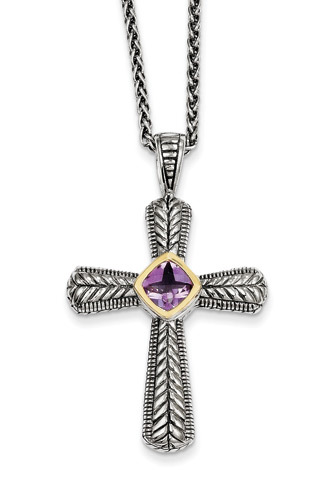 A genuine cushion-cut amethyst gemstone is set in a 14k yellow gold bezel setting in a .925 sterling silver cross necklace with etched/grooved design. Necklace measures 18" in length. Cross pendant measures approx. 1 5/16" tall (or 1 5/8" tall with hoop) x 1" wide. View our complete collection of quality Gemstone Crosses. We guarantee our Amethyst Cross Necklace, Sterling Silver & 14K Gold to be high quality, authentic jewelry, as described above.